Soused cinema enthusiasts received a late Christmas gift today when the Library of Congress announced the list of 2011 inductees in the National Film Registry. Under the terms of the National Film Preservation Act, each year the Librarian of Congress names 25 films to the National Film Registry that are "culturally, historically or aesthetically" significant. Amongst this year's list is The Lost Weekend, probably the most important booze movie ever produced. 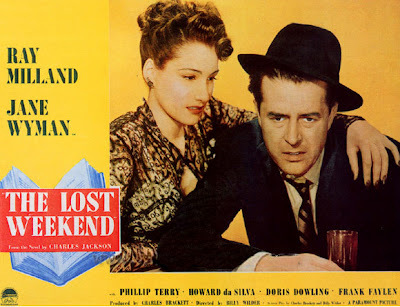 A landmark social-problem film, "The Lost Weekend" provided audiences of 1945 with an uncompromising look at the devastating effects of alcoholism. Directed by Billy Wilder and co-written by Wilder and Charles Brackett, the film melded an expressionistic film-noir style with documentary realism to immerse viewers in the harrowing experiences of an aspiring New York writer willing to do almost anything for a drink. 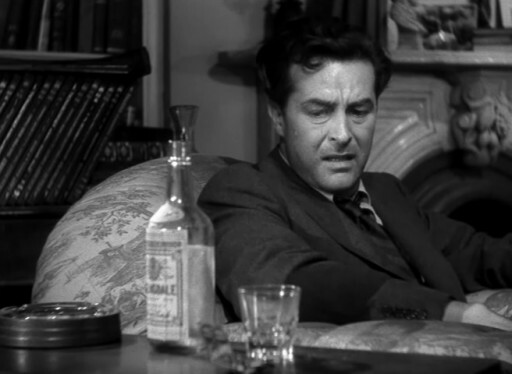 Despite opposition from his studio, the Hays Office and the liquor industry, Wilder created a film ranked as one of the best of the decade that won Academy Awards for Best Picture, Direction, Screenplay and Actor (Ray Milland), and established him as one of America’s leading filmmakers. Have a safe and happy new year, and check out the excellent boozy dark comedy, Young Adult, if you get a chance. I'll post a full review of Young Adult when it's released on video, but consider it highly recommended. Before the Rat Pack (Frank, Dean, Sammy, etc.) and the Bundy Drive Boys (W.C. Fields, John Barrymore, Errol Flynn, etc.) there was the Algonquin Round Table--a loose social club of playwrights, humorists, theater critics, and actors that gathered at the Algonquin hotel in the 1920’s and 30’s to lunch, toss off bon mots, play word games, gossip, flirt, and drink. Most of the group--Dorothy Parker, Robert Benchley, Robert Sherwood, George S. Kaufman, Charles MacArthur, Marc Connelly, Franklin R. Adams, and Alexander Woolcott among them--became more famous for their witticism-laden lunches and for their alcohol intake than they did for their writing. The dizzy nights and hung-over mornings of the Round Table are captured sporadically in Alan Rudolph’s film, Mrs. Parker and the Vicious Circle. This biopic focuses on Dorothy Parker (Jennifer Jason Leigh), one of the wittiest and most celebrated members of the Algonquin group. 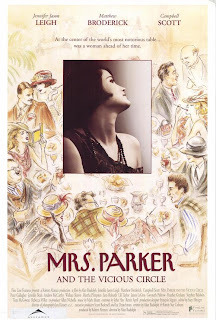 Rather than covering a lifetime, the film focuses on two important periods for Mrs. Parker--her later years as a Hollywood screenwriter, shot in black and white, and her Jazz Age heyday, shot in color (but leaning heavily on browns). More than anything else, the movie focuses on Dottie’s soulful friendship with fellow Algonquinite Robert Benchley (Campbell Scott) and her constant struggles with depression. Unfortunately, Alan Rudolph’s film often comes across as warmed-over Robert Altman (a producer on the film). While Mrs. Parker and the Vicious Circle features a large canvas and a multitude of characters to fill it, the movie doesn’t have the sense of spontaneity or visual flair that buoys even the most middling of Altman’s output. The picture has its draggy sections, and the total effect of the film is to leave the viewer awfully depressed. To be fair, it is hard to imagine telling the story of a woman who tried to commit suicide multiple times without bringing the audience down a bit. It may sound like I’m panning the picture, but in truth, I’m actually quite fond of it. Primarily, I love the Algonquin wit that is peppered throughout the script. The boozy bon mots help balance out the more downbeat sections of the story. It also doesn’t hurt that much of the humor is alcohol-related. Secondly, Jennifer Jason Leigh and Campbell Scott’s performances are remarkable, perhaps their best on film. Leigh captures Parker’s savage wit and fragile spirit, as well as her rather unusual vocal tone (Dottie really did talk like that). Scott also does an uncanny job of capturing Benchley’s mannerisms, self-deprecating humor, and dry delivery. I must admit that I am a sucker for period pieces set in the 20’s and 30’s, and I’ve had an interest in the Algonquin Round Table from the time I read Harpo Marx’s autobiography as a child. Consequently, I was predisposed to like the picture, despite the fact that it did not fully convey the humor, intelligence, camaraderie, and bitchiness of the group. All in all, Mrs. Parker and the Vicious Circle is a cocktail that tastes vaguely off. Still, it has enough good stuff in it that it is hard not to grudgingly recommend. 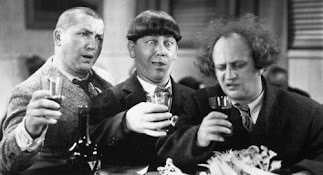 Potent Quotables-- DOROTHY PARKER: One more drink and I’ll be under the host. Similarly Sauced Cinema--If you, like me, prefer docs to biopics, you may want to seek out the Academy Award-winning documentary, The Ten-Year Lunch: The Wit and Legend of the Algonquin Round Table (1987).